Aura helps its clients, some of the UK’s most important companies, to build strong and sustainable relationships with their most demanding and in-demand audiences. With obsessive attention to detail, Aura delivers world class guest list and invitation management, and produces elegant, premium and cost effective international events. "We very much admired the creativity and the professionalism of your team." "There was no faulting the event held in the Saatchi Gallery - it was truly spectacular . This was a true bash, a throwback to the adland parties of the Eighties. Advertising may not be what it was but for one, crazy night we were able to roll back the years." Aura designed the spectacular celebration of 40 years of the Saatchi brand hosted at the iconic Saatchi Gallery, London. 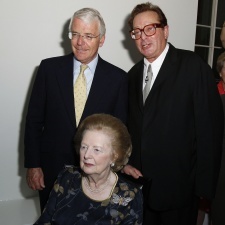 1,600 guests, including Baroness Thatcher, Sir John Major and Lord Lloyd Webber, indulged in 4,200 glasses of champagne, 2,200 cocktails and 13,200 canapés against stunning backdrops in the avant garde, gothic, ghost and neon galleries.